St. Louis barely missed the playoffs this year and already has set about making sure that won't be the case in 2019. The Cardinals swung a deal earlier this month for D-backs first baseman Paul Goldschmidt and could be big players the rest of the offseason, depending on the money they want to spend. If the Cards aren't of the mind-set to look outside the organization for help, they've got options within, even with the talent they gave up to make their first big offseason deal. St. Louis' system posted the third-best overall record among any organization in baseball at 492-402 and boast the Triple-A champions in Memphis. Class A Advanced Palm Beach, Class A Peoria and the Rookie-level Gulf Coast League Cardinals also reached the playoffs. With a whiff of postseason success, Cards prospects have their sights set on finding the same at the game's highest level. Catcher -- Andrew Knizner, Springfield (77 games), Memphis (17 games): The Cardinals dealt away catcher Carson Kelly in the Goldschmidt deal, moving Knizner into the role of heir apparent to Yadier Molina behind the plate. After putting up a .313/.365/.434 slash line in Springfield, the North Carolina State product moved up to Triple-A, where he posted similar numbers in a cameo, batting .315/.383/.407. And behind the plate, he's progressing. "I think his next step, No. 1, is receiving," said Stubby Clapp, who managed Memphis in 2018. "He's got to get himself a little bit more confident behind the plate in being able to receive several different types of pitchers and being able to handle and call a game. He does that well, he's just got to continue to get better at that and understand how to use each pitcher's repertoire in order to face different lineups and stuff like that and make those adjustments. He'll go from there." First baseman -- Luken Baker, GCL Cardinals (8 games), Peoria (37 games): Yes, St. Louis may have acquired one of the best first basemen in the game in Goldschmidt, but going forward, Baker may be next in line. "Very advanced approach, very patient hitter, not afraid to get into a two-strike count or get behind in the count and work his way out," Class A Peoria manager Chris Swauger said of the TCU product. "When he got pitches to handle, his true shining aspect came out, which is this guy hits the ball harder than anybody, I think, than we have in the organization and harder than a lot of guys in the Major Leagues hit it on a consistent basis." Baker hammered 28 homers in three seasons at TCU but was hampered by injuries ,including a broken fibula and torn ankle ligaments last spring. Still, he rebounded with a .319/.386/.460 slash line to go with four homers and 22 RBIs in his professional debut. "He was just barely cleared for full activities when he got to us," Swauger noted. "I think the biggest thing is just to continue the progress he's made as far as his health coming off a traumatic leg injury and continue to develop his general athleticism coming out of that. That's one of his assets, that he can do some things pretty well for a big guy, but now we're trying to make him into a really athletic big guy." Second baseman -- Andy Young, Palm Beach (84 games), Springfield (35 games): Young's season was so good, he was part of the package Arizona wanted for Goldschmidt earlier this month. The Indiana State product was steady for Class A Advanced Palm Beach, batting 276/.372/.444 before a promotion to Double-A, where he was even better. Young raked at a .319/.395/.556 rate for Springfield, belting nine homers in 35 games -- he hit 12 in 84 at Class A Advanced -- and lifting his season OPS to a career-best .858. His glove was fantastic, too. The 2016 37th-round pick posted a .992 fielding percentage for Springfield, committing just one error in his Double-A stay. 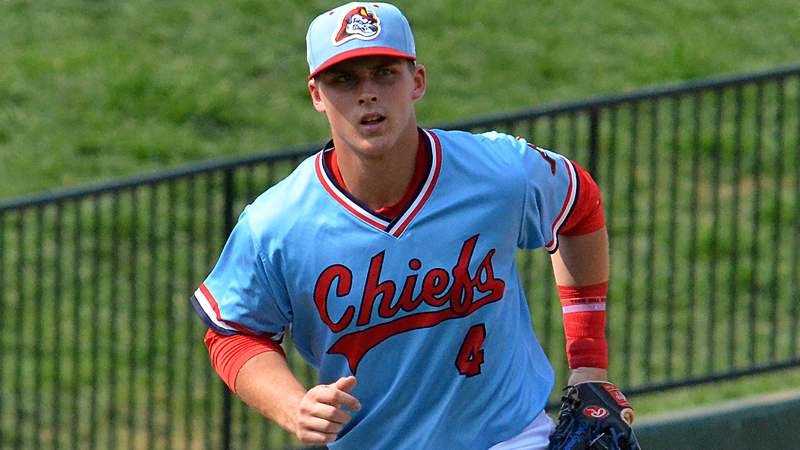 Third baseman -- Nolan Gorman, Johnson City (38 games), Peoria (25 games): Gorman may have been the best power bat in this year's Draft and went to the Cardinals at 19th overall. After dominating the Appalachian League with a .350/.443/.664 line, 11 homers and 28 RBIs in just over a month, he became the seventh first-round pick out of high school to reach full-season ball in his debut year. "You talk to this guy or you're around him for a certain amount of time and you wouldn't think that he was at prom a few months before we got him," Swauger said. "He's just very advanced for his age. Obviously, what he did in the Appalachian League as one of the younger guys in that league, the type of numbers he put up were phenomenal." After being bumped to Peoria, Gorman got his feet wet as one of the youngest players in the Midwest League, batting .202/.280/.426 with six more homers. "To come to us and be challenged with a league and a place where he had never seen that many breaking balls or that many guys that can mix and could attack any weakness that he had, that had that much data on him, he'd never been in a spot where guys could attack him like that," Swauger said. "For him to still put up numbers, still have really good results, especially on the power side, I thought was really impressive." Shortstop -- Edmundo Sosa, Springfield (67 games), Memphis (56 games), St. Louis (three games): After dealing with injuries that limited him to 155 games in 2016-17, Sosa played 126 this year while reaching the Majors for the first time. The 22-year-old saw time primarily at shortstop but also got time at second and third in his two Minor League stops. Between them, Sosa batted .270/.313/.420 for a .734 OPS, a personal best for a full season. Utility player -- Ramon Urias, Springfield (44 games), Memphis (46 games): Urias and Sosa both could've occupied this spot due to their versatility, but Urias gets the nod by playing all four infield spots in his first full season in the U.S. A former Rangers prospect who spent the 2011-12 seasons in the Rookie-level Dominican Summer League, Urias played for Mexico City in the Mexican League from 2013-17 before joining the Cardinals. While playing mostly second base for Springfield, he batted .333/.406/.589 to earn a bump to Triple-A. At the Minors' highest level, Urias put up a .306/317/.387 line in 15 August games. "He can catch the baseball defensively," Clapp said. "You can put him anywhere you want in the infield and he'll catch the baseball and get it over to first base or do whatever he needs to do with it. He's pretty slick. He's got good hands and he knows how to position himself. That's the key with him. As far as his hitting, he doesn't look like he has as much pop as he does, but when he gets the barrel to the ball, he can hit it a long way." Randy Arozarena, Springfield (24 games), Memphis (89 games): One thing sticks out when Clapp evaluates Arozarena's most important contribution on the field. "His energy," St. Louis' new first base coach said. "When he's good, when he's rolling, he plays the game hard, plays the game fast and gives himself an opportunity to be dominant on the field. He's got a little bit of power and he's got a little bit of speed. That makes for a good combination when it's clicking together." Arozarena dominated the Texas League with a .396/.455/.681 line but scuffled a bit at Triple-A before evolving at the Minors' highest level. Though he batted .232/.328/.348 for the Redbirds, the 23-year-old impressed his manager in spurts. "I think he just needs some consistency at the plate," Clapp said. "He gets a little bit more consistency at the plate to show that he can hit at the highest level, meaning Triple-A, in order to get to the big leagues, if he shows he can do that at a good clip, they'll take a good look at him." Lane Thomas, Springfield (100 games), Memphis (32 games): Acquired from the Blue Jays in July 2017, Thomas busted out in his first full year with St. Louis. The 2014 fifth-round pick had 18 professional homers heading into this year and hammered 21 in his time with Springfield to punch his ticket to Triple-A. There, he hit six more. In total, Thomas batted .264/.333/.489, driving in 88 runs and piling up six triples and 23 doubles. Tyler O'Neill, Memphis (64 games), St. Louis (61 games): Although he spent nearly as much time in the big leagues as the Minors and graduated from prospect status, O'Neill's first half was so impressive that he earned his third Organization All-Star nod in his second organization. The Mariners' 2013 third round pick crushed Triple-A pitching to a .311/.385/.693 line with 26 homers and 63 RBIs, earning Pacific Coast League end-of-season All-Star recognition. Right-handed starter -- Dakota Hudson, Memphis (19 starts), St. Louis (26 games): Hudson thrived in the rotation at the Minor League level before shifting to the bullpen in St. Louis, thanks to a series of qualifications that works in all capacities. "[He's] a guy that attacks hitters with a good set of weapons and knew how to read hitters and apply his weapons," Clapp said. Hudson went 13-3 with a 2.50 ERA and 87 strikeouts against 38 walks over 111 2/3 innings in the Redbirds rotation before moving up to the Cardinals in late July and not looking back. Selected to midseason and end-of-season All-Star teams for the second year in a row, he also was named Pacific Coast League Pitcher of the Year, repeating the honor he earned in the Texas League in 2017. "I think it's attitude and confidence, and he's got both," Clapp said. "He's got a great attitude with how he approaches the game and he's got confidence in his stuff because he's had some success. When you add those two things together, anything good can happen." Left-handed starter -- Jake Dahlberg, State College (nine games, eight starts), Peoria (seven starts): A 21st round pick out of Illinois-Chicago last year, Dahlberg made 19 relief appearances for Rookie-level Johnson City in his debut season. Moved to the rotation, he thrived. The southpaw put up a 2.50 ERA, struck out 77 against 19 walks, posted a 1.15 WHIP and allowed only two homers over 97 1/3 innings. "With Jake, it always starts with the bulldog mentality that he brings to the mound," Swauger said. "I think if you were to just look at his stuff and the physical characteristics of it, you wouldn't be totally overwhelmed, but the fact that he brings a certain attitude and edge when he gets on the bump just makes his stuff play up so much better." Dahlberg allowed more than three earned runs just twice in 16 outings. His season hit its high point on Aug. 13 for Peoria when he tossed a complete-game shutout, scattering eight hits and striking out six without issuing a walk. "He's a guy who knows himself," Swauger said. "He really owns his stuff. He does a good job of pitching at the bottom of the zone with the type of stuff that he has. He has a really, really good weapon with his changeup. He throws it a lot, threw it a lot for us, and everything else that he has plays really well off of that. You combine all of those factors and you've got a pretty good result." Relief pitcher -- Patrick Dayton, State College (two games), Peoria (20 games): Dayton's first two outings of the year came with State College and didn't suggest good things to come. The southpaw surrendered four earned runs on six hits over 2 2/3 innings for a 13.50 ERA, but after a promotion to the Midwest League, he took off. Dayton allowed only three earned runs in 20 outings for Peoria, posting a 0.78 ERA and finishing his stint with 10 straight scoreless appearances. The Kent State product fanned 54 over 37 1/3 innings for an eye-popping 34.5 percent strikeout rate.